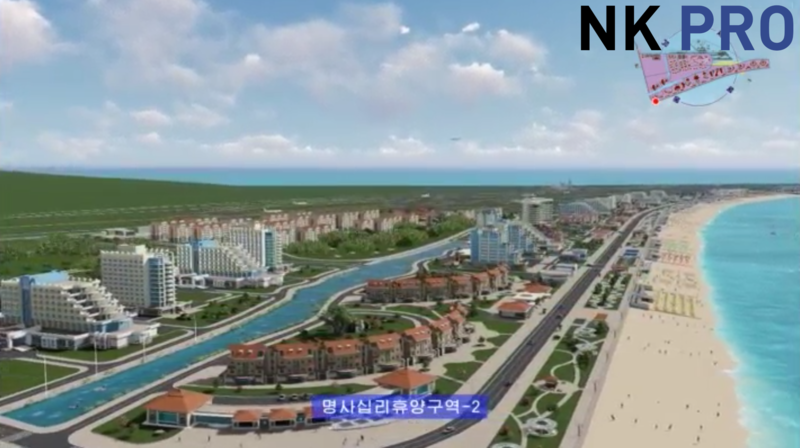 A video presentation of North Korea’s large-scale Wonsan Kalma beach resort project currently under construction recently obtained by NK Pro has revealed its original scale and the nature of changes to the plan occurring on the ground in recent months. The short film, provided by a source not directly involved in the project, and part of which was also published Thursday by Japan’s Asahi Shimbun, appears to have been made prior to when construction first began in early 2018, though aside from a few major changes, most aspects remained in tact through Kim Jong Un’s second visit to the site in August. 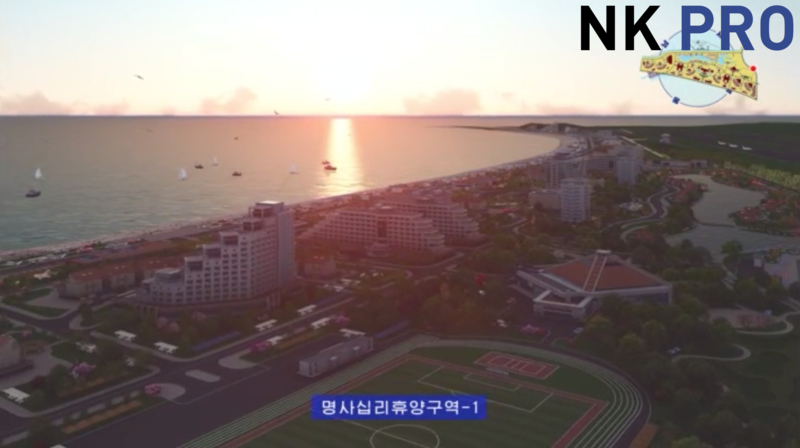 Likely produced in North Korea as either a proof of concept or to attract investors, the video offers a fully labeled top-down map and an animated fly-through past 3D renders of dozens of large hotels, shopping centers, beach amenities, and even an “international telecom company” building. 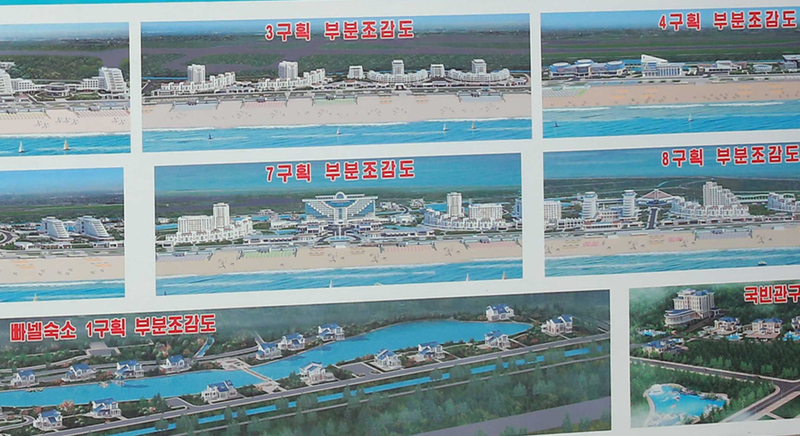 While satellite imagery and photos of the full Wonsan-Kalma Coastal Tourist Area blueprint released after Kim’s August site inspection prove multiple aspects of the plan changed throughout the construction process, the video clarifies some previously murky details of the new tourist zone, officially slated for opening just before winter this year. The presentation begins by introducing each sector of the five-kilometer stretch of beach through a top-down view, labeling each building. It then moves on to full views from the ocean, from the adjacent Kalma Airport, and finally a fly-through animation complete with a warm sunset, bustling streets with cars and buses, and beachgoers along the entire strip. Open areas of beach along the entire stretch are broken up by 25 lounge stations hosting 70 beach umbrellas each, as the camera zooms past playgrounds, a ferris wheel, shopping strips boasting large screens, and all the beachside installations of a typical tourist resort. 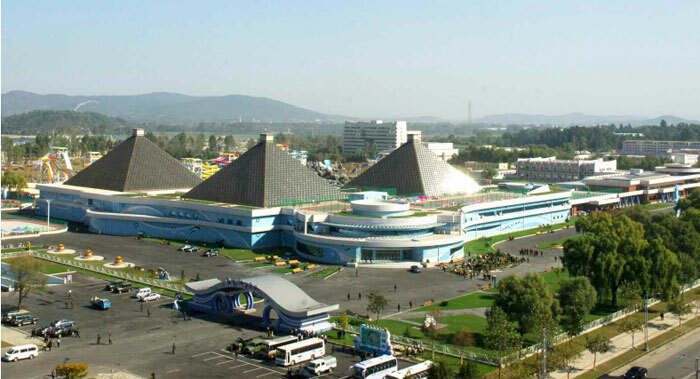 The indoor waterpark features a pyramid-shaped roof resembling the Munsu Water Park in Pyongyang. Restaurants appear to host large outdoor shaded seating spaces. A few buildings such as the telecom center and financial services center even appear to have attached small empty parking lots. It is a presentation of a clean, all-inclusive (likely fenced-off) resort town just meters away from the airport ferrying in tourists year-round, as planes take off and land in the background throughout the video. The architectural design – already shown in pre-construction propaganda posters and indeed in on-site images released by state media and foreign visitors – is consistent with that typically produced by the Pyongyang University of Architecture (openly tasked with the project), and the video’s soundtrack is what one would typically hear on state television. It is likely that it was produced in North Korea by those closely involved in the project, but it is unclear if it is either intended for potential investors or simply as a proof of concept – and it is also important to remember that North Korea once enlisted the help of a Hong Kong-based architectural firm for the Kalma Airport before the current version was built. The fact that all labels in the video are in Korean certainly does not prove it is not intended for foreign investors, but it is also likely that such presentations or walk-throughs of the full scale of the project would be produced and passed to authorities, often by the designers. If it were for foreign investors, however, interested parties may wish to receive updated plans given the number of changes evident in blueprints and on-site images released in the latter half of 2018. 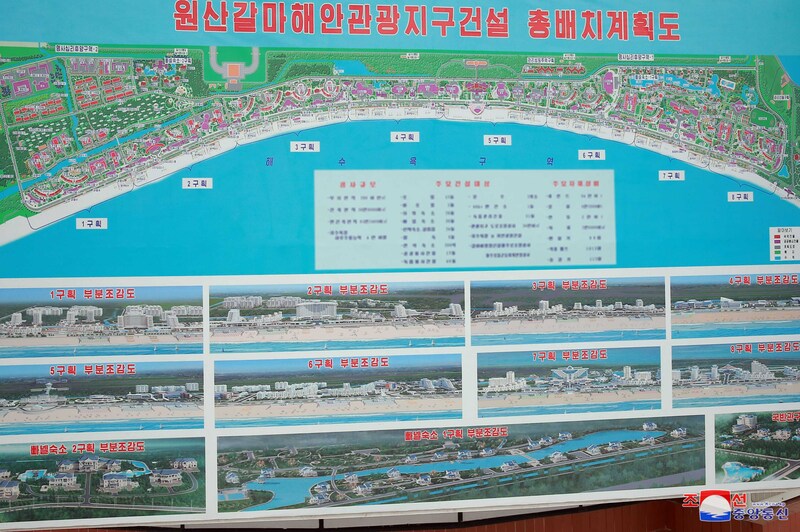 Though initial foundation work along the beach had yet to even begin one year ago, the project has already seen a number of alterations both in between inspections by Kim Jong Un and between the plan shown in the 3D presentation video and maps shown on-site last August. First, the map from the video appears simplified, excluding dozens of smaller structures and details such as floor counts for buildings shown in subsequent blueprints. Shown in full view during Kim’s August 16 visit, a map displayed on site also included 12 hotels and 26 shopping centers, but a new “lodging” or “villa” building brought the total to 28, and the floor count for some such hotels and lodgings was revealed to be 11 and 12 floors each. Some aspects appear to have been changed before construction began in late January 2018. The complex of four-story residential apartments at the beach’s southern tip, for example, had already expanded to fill the empty plot labeled reserved in the video by the time foundations first started appearing in satellite imagery. But others appeared to change only after construction began, such as the main open square, shown featuring fountains and benches in the finale of the video, which was replaced in the August blueprint with a large, multi-tiered building connected by a bridge to the airport viewing platform. A review of satellite imagery revealed work on the previously cleared square began in late July, between Kim’s first and second visits. An area adjacent the airport runway – empty in the map in the video and shown housing temporary shelters for the project’s conscripted soldier-builders during Kim’s first visit in May – was replaced in the August map with a new stylistic complex of homes for workers who will run the tourist zone (관리성원주택). A “traditional Korean culture complex” – elements of which appeared on display and possibly even under construction in a May video on state television – was axed in favor of a complex of mansions and pools presumably reserved for high-paying guests. 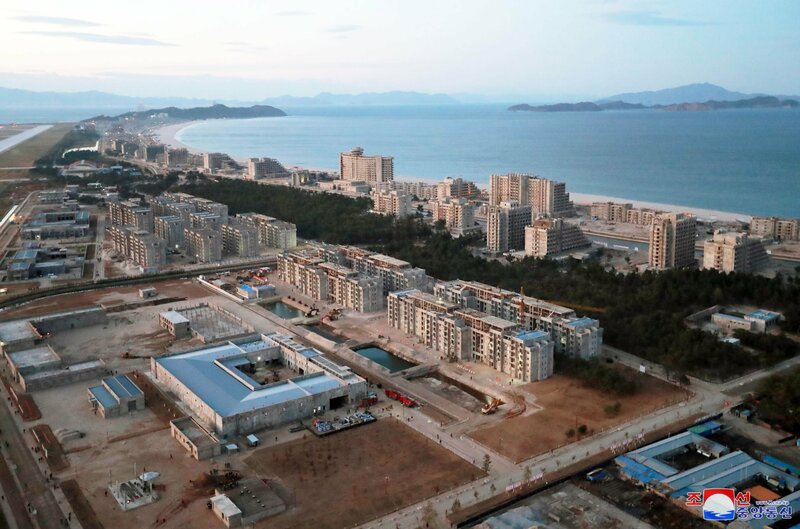 New mansions are also to be added to the site of a new official state guesthouse at the northern tip of the peninsula – the site of an existing hotel where foreign reporters stayed on their way to witness the Punggye-ri demolition, reporting the smell of fresh paint and other signs of renovation last May. A recent review of satellite imagery by 38 North revealed additional changes to both the pre-construction and August maps, showing active construction throughout the fall with buildings receiving new annexes and empty areas seeing new buildings entirely. High-resolution satellite images in that report showed that the Olympic-sized pool at the northern end of the beach was demolished (in mid-September, further analysis of satellite imagery shows), making way for entirely new structures and additional huts stretching from those surrounding a narrow waterway in the original map shown in the video. 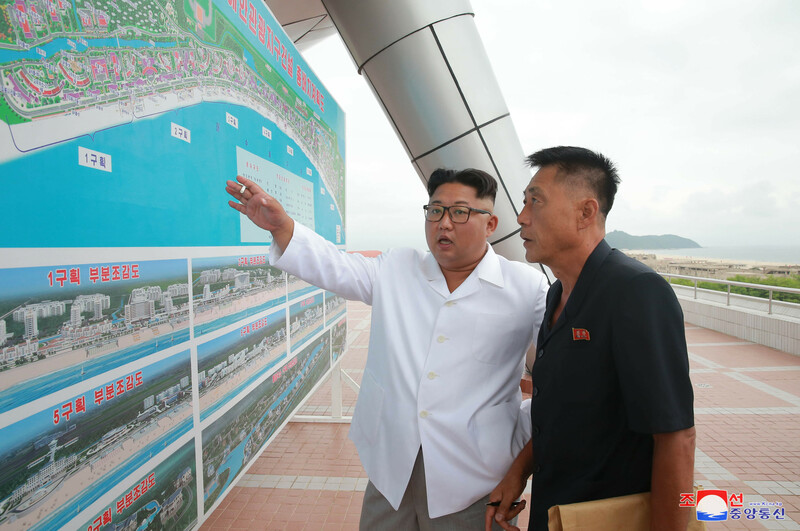 Though Kim also called for the building of 30-story high-rises and office buildings along the beach, a review of recent satellite imagery shows that while progress continues apace, no such buildings have yet appeared. Reports of that visit in DPRK state media continued to push the official target completion date for Wonsan Kalma as October 2019. But whether it is finished by that time or is able to attract the kinds of numbers of foreign tourists North Korea appears hoping for – especially given perception of it being built with lightning speed using forced labor – is yet to be seen. Colin Zwirko is an NK News correspondent based in Seoul. He previously worked at the Daily NK.